The relationship between a mother and her child is a complex one, not to understate it. Mom is the only person in this world who has really known us our entire life, and then some! As we grow, we may stray away from each other, but the bond is always there, no matter what – whether we like it or not. Mom is that one person we can never explain to anyone else and we are the only one who sees her in a particular way. Vice versa, Mom can only see us in a certain way unlike anyone else. The Strand Theatre’s latest production, ‘Night, Mother by Marsha Norman, Directed by Anne Hammontree, peeks behind the curtain into one strained and intricate relationship between an “it-is-what-it-is” kind of mother and a daughter who has managed to find herself in a deep, dark place with only one seemingly way out. It’s a 90-minute snapshot in the lives of two women that is chillingly, but poignantly real. Briefly, ‘Night, Mother concerns itself with Jessie, the daughter, and Thelma, the mother as they go about a regular Saturday night with one twist… Jessie has announced that she has decided to commit suicide within the next hour or so. Through the dialogue, we discover more about these characters and Jessie’s reasoning for making such a decision, as well as a little family history and feelings that had not been discussed before. As Thelma tries to convince Jessie that she can’t go through with her plan, it’s clear that Jessie has thought it through and might not be convinced. I’d seen the 1986 film version of ‘Night, Mother, starring Sissy Spacek and Ann Bancroft (which I highly recommend) but this stage production of this piece is my first venture to Strand Theatre (and I don’t know why I waited so long!) and the space is unique but absolutely charming. Set Design by TJ Lukasina is, without a doubt, superb. The details from the working sink in the kitchen, to the lit lamps, to the grandfather clock that actually chimes on the hour are impeccable and give an authentic feel to the piece. This design puts the audience right into the action and makes one feel as though he or she is sitting at the kitchen table with these two ladies which keeps the entire production appealing throughout. The interestingly shaped space was not match for Lukasina as he transforms it into a living space that is cozy and real that adds great value to this production. Anne Hammontree takes the reigns of this production of ‘Night, Mother, and it’s clear she has a great comprehension of this piece, overall, and the thoughtful dialogue. Her staging is on point and though this piece could very well be two people sitting at a table talking all evening, she keeps the action going and engaging for the audience. It’s a challenging piece, but her casting is spot on and the presentation is clear and concise making this a delightful and thoughtful evening of theatre. Moving on to the performance aspect of this piece, Kathryn Falconetakes on the role of Thelma (Mama) Cates and Andrea Bush tackles the role of Jessie Cates. Both of these actress give strong, confident performances and their chemistry is incredible. From time to time, I completely forget these are two actresses performing roles in a play rather than a mother and daughter on a regular Saturday night – that’s how good they work with and off of each other. From the moment she steps onto the stage, Kathryn Falcone completely embodies this character. Her delivery of the text is natural and she’s quite comfortable in this role with a strong presence and purpose. Falcone’s understanding of this character is clear and the audience can feel her urgency throughout the production. Overall, a job well done and Falcone should be commended for her splendid performance. As Jessie Cates, the totally capable and able Andrea Bush could not be better suited for this role. It’s clear that Bush pulls from a very deep place to pull out this interpretation of this character. She becomes this character from the moment we see her walking onto the stage carrying bath and beach towels. Her instincts are correct and her compassion for this character guides her hand. She has a good grasp of what her character is going through and presents it authentically and clearly with a confident presence with a delicate handling. Kudos to Bush for an outstanding performance. Final thought… ‘Night Mother is a heart-wrenching look at strained mother-daughter relationship full of resentment and regrets, but with a deep love for each other. It’s also a redemption, of sorts, with new connections and positive self-realizations. It’s an emotional roller-coaster that brings out the best and worst in family relationships, especially between mothers and daughters, when they are seem to be so similar but are actually vastly different. This one hit home hard for me. TRIGGER WARNING: this piece deals with suicide. However, it presents this story exceedingly well with poignancy as well as with a pinch of humor, giving a well-blended mix of ups and downs that make for a good drama. The performances are authentic and natural, and the characters are extremely relatable. The staging and pacing is on point making for an impeccable evening of theatre. Do yourself a favor – grab your tissues and get out to experience this show! It’s not one you want to miss this season. This is what I thought of The Strand Theatre’s production of ‘Night Mother… What did you think? Please feel free to leave a comment! 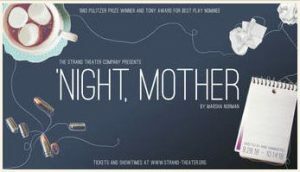 ‘Night Mother will play through October 14 at The Strand Theatre, 5426 Harford Road, Baltimore, MD. For tickets, call the box office at 443-874-4917 or you can purchase them online. 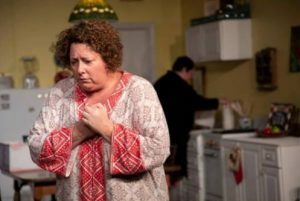 This entry was posted in Reviews and tagged 'Night Mother, Andrea Bush, Anne Hammontree, Baltimore Theatre, Kathryn Falcone, The Strand Theatre, TJ Lukacsina by Jason. Bookmark the permalink.